Told from Tanya's point of view as she tries to outrun her past, we're given glimpses of her secrets with these epistolary email clues between her and someone from her hometown. As the story moves along, we gain a bit more of an understanding as to who the mysterious writer is to our heroine. It starts off at a rather frenetic pace, especially when she meets 'Blue.' However, somewhere after the second or third persona she takes on (out of at least FIVE), it shifts into a slower gear. It was a bit tedious reading about her stealing another driver's license, going to another cheap motel room, etc. that it was losing it's urgency. Lather, rinse repeat. The hometown email exchanges power the story along, as it gives just enough little glimpses into her past to keep you intrigued and wanting to know the full story. Honestly, I think that the author should have parsed out MORE in these messages, because the 'big reveals' in the last part of the book were huge and plentiful. 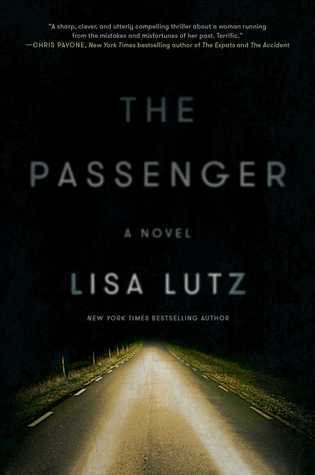 I think that the very end would still have had the desired gut punch, even if Lutz gave more hints earlier in the book - especially during the repetitive parts. I also would have liked to know more about my main character. I was having a hard time deciding whether I should root for her demise or redemption. In the end, it was some compelling stuff and it actually reminded me a LOT of a major plot line in Veronica Mars, which is one of my all time favorite shows. I find myself still thinking about it, days after I've finished. I can't put my finger on exactly what it is, but I love your writing style. I come back to read your posts all the time. I was shocked to see that you changed the blog to Born and Read, but I'm a lot like you--I love to run, read, write, and travel. (I don't think you've ever listed travel as one of your passions, but based on your posts, we have a lot in common, so I'm guessing it is...?) Anyway, I love your racing recaps, so I hope to see a lot of those in the future, too, but I also look forward to your blog as a book review blog! Well, thanks for always visiting - I hope it didn't come as TOO much of a shock :) Yes, I love to travel, I have a couple of posts about the adventures I've gone on around the world with my mom. Once I stayed home with the kids, though, my free time and finances for such travel has changed! And for sure, when I race, I'll recap it.